K–8 educators from across the country give you a peek at their classrooms—and explain how they managed the transformations. 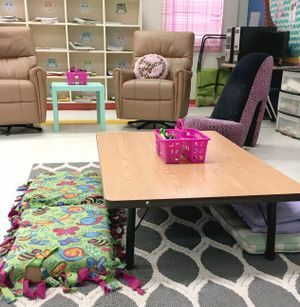 In March, with the end of the school year rounding into view, we asked our Facebook community to show us their flexible seating arrangements. Photos and comments poured in from hundreds of teachers across the country. We sifted through the submissions, identified educators with outstanding flexible classrooms from kindergarten through eighth grade, and asked for tips, classroom features, and plenty of visuals. We feature seven of those classrooms below. A few clear trends emerged. 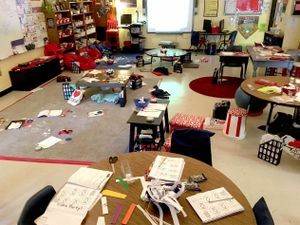 While many K–8 teachers in our Facebook discussion expressed doubt that flexible seating would work in their small classrooms, our respondents were making flexible seating work in classrooms as small as 432 square feet. The number of students in these flexible classrooms ranged from 12 to over 50 (in a music class), with most teachers reporting head counts in the 20s. Funding came from a wide variety of sources; most teachers mixed friend and family requests with visits to garage sales and thrift shops, low-price retailers like Walmart and Amazon, and online crowdfunding campaigns on sites like DonorsChoose. 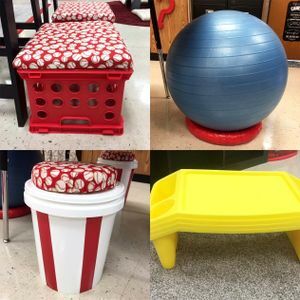 Low-cost seating options like rugs, crates, and yoga balls with braces were ubiquitous in the classrooms we reviewed. Almost all of our K–8 teachers have dropped seating charts but devote time to modeling appropriate behaviors in their new classrooms. 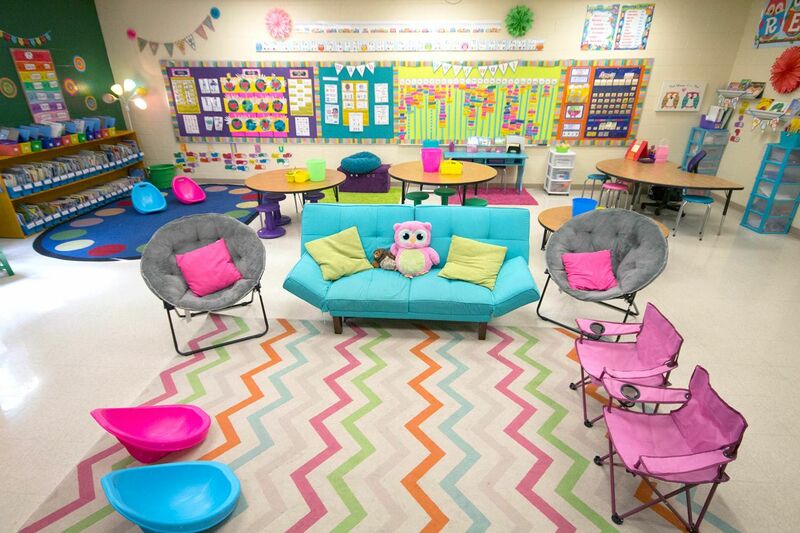 Many require that all students try each seating option several times; it’s critical for students to understand the full range of learning modalities that flexible seating supports. 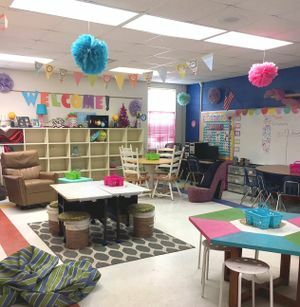 Several teachers use seating contracts to formalize the expectations—you can see a typical contract here. Setting It Up: The furniture includes chairs from Scholastic Book Club points, balance ball seats with support legs and small plastic chairs from Amazon, eight crate seats, some scoop rockers and wooden stools, and six standard student chairs that I plan to change out for stackable stools soon. I also have four small teardrop-shaped tables from Hobby Lobby. I am piloting multisensory cursive handwriting in kindergarten for the Madison County School System, so all of the students also have plastic desk trays from Hobby Lobby to give them a solid writing surface when we are at the carpet during cursive time. Tips: I don’t have a particular system for choosing seats; students pick a seat in the morning and it’s theirs for the day. 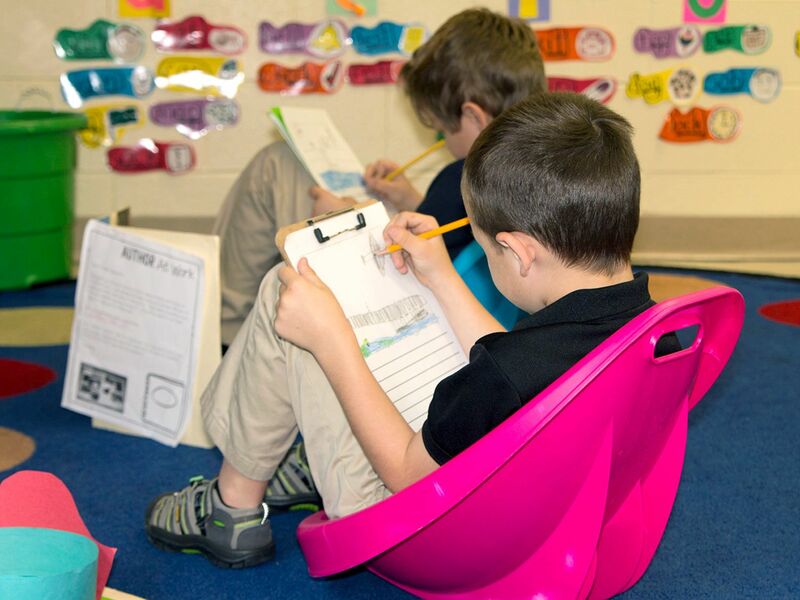 I modeled explicitly how each type of chair could be used at the beginning of the year. We reviewed the rules, expectations, and consequences multiple times to ensure the students understood them. Clear expectations are a must. Benita Kay Moyers’s students turned the storage countertop into a work station. Moyers’s students have a range of table heights to choose from, a common feature of flexible classrooms. The tennis balls on the central table’s legs make it both easier and quieter to move the table. 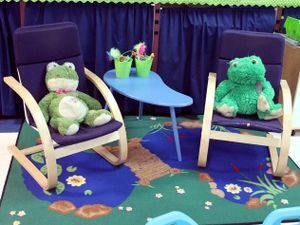 Moyers zoned off a reading area by placing two rocking chairs and a small table on a throw rug. Setting It Up: I’ve included a lot of different options for my students. I have three round tables of different heights, with seating that ranges from simple mats to wobble stools. I also have a couch, a few rockers and stools, and several rugs where children can sprawl and work using clipboards. How did I fund it? I purchased floor mats and rockers at Walmart, funded some of my furniture using Scholastic Book Club points, acquired a few things at garage sales, and was given the couch and the chevron rug by a former parent. 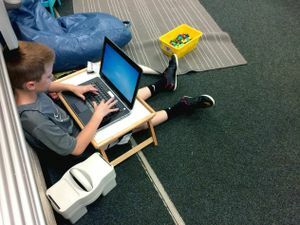 The last school year was my 13th year teaching, and my first with flexible seating. It made a huge difference. Tips: My students take more responsibility and are more engaged with their assignments because they feel a sense of pride and comfort working in “their” area. At the beginning of the year, I had each student try out all the different spots to see which ones they liked the best. A lot of people worry about managing the spots fairly, but it wasn’t an issue in my classroom. I’ll never go back to traditional seating. 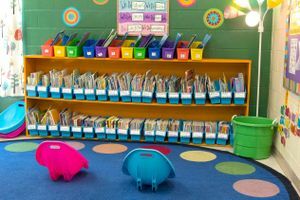 The long bookshelf in Ashley Rice Broomfield’s reading corner helps address the elementary school teacher’s universal need for storage. Broomfield’s room offers a variety of seating options, from a couch to scoop chairs to wobble stools. Broomfield’s students use clipboards when they need a flat surface and aren’t working at tables. 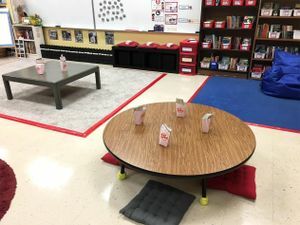 Setting It Up: I wanted to create a flexible seating environment that allowed my students to choose seats that are comfortable, something better than a basic plastic seat and desk. I brought in recliners, which are the most popular choice, and I’ve got a unique option in a chair that looks like a high-heeled shoe, which was the gift of a co-worker. There are tables of different heights and shapes—one of the tables I shortened by cutting off the legs—and there are stools, bucket seats with cushions, and more traditional chairs. Tips: Setting expectations in the beginning for each seat choice is crucial, and you should have a plan for choosing seats. I randomly draw student names, and each student signs up for a new seat each week. Flexible seating has made an amazing difference in my classroom—it creates a student-centered environment and promotes responsibility. 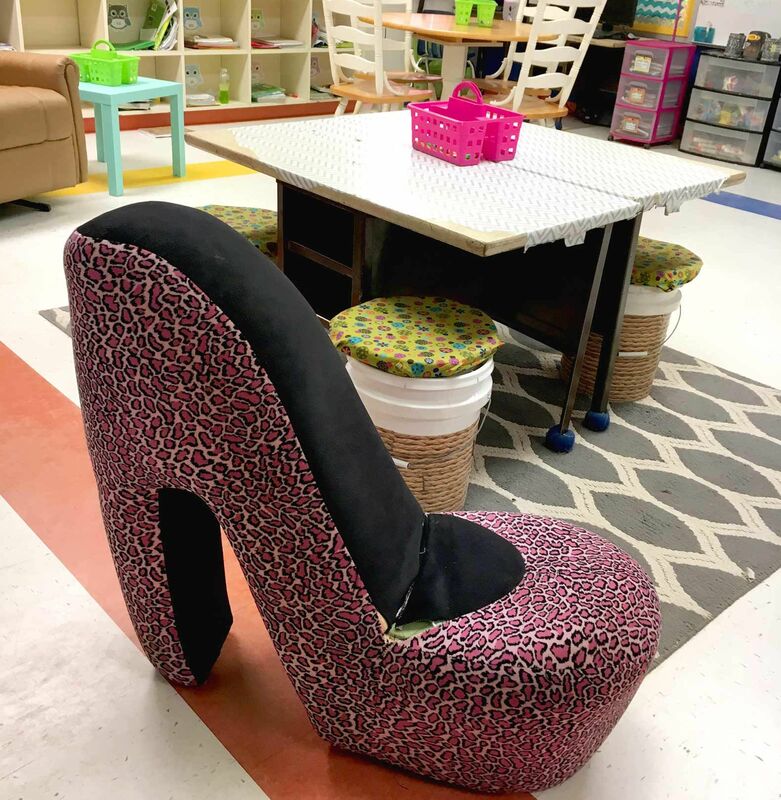 Jessica Dudley has something few teachers can boast of—a chair shaped like a high-heeled shoe. Dudley cut off the legs on one of her tables to create a low seating option—the DIY approach is common in flexible classrooms. Dudley uses a variety of decorations to make her room feel a bit more festive. 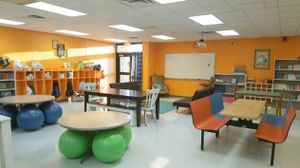 Setting It Up: Our goal was to provide students with a flexible, comfortable learning environment. We incorporated tables, booths, futons, laptop bars, and even church pews. One of our biggest purchases, a favorite of students and adults, was the Hokki stools. 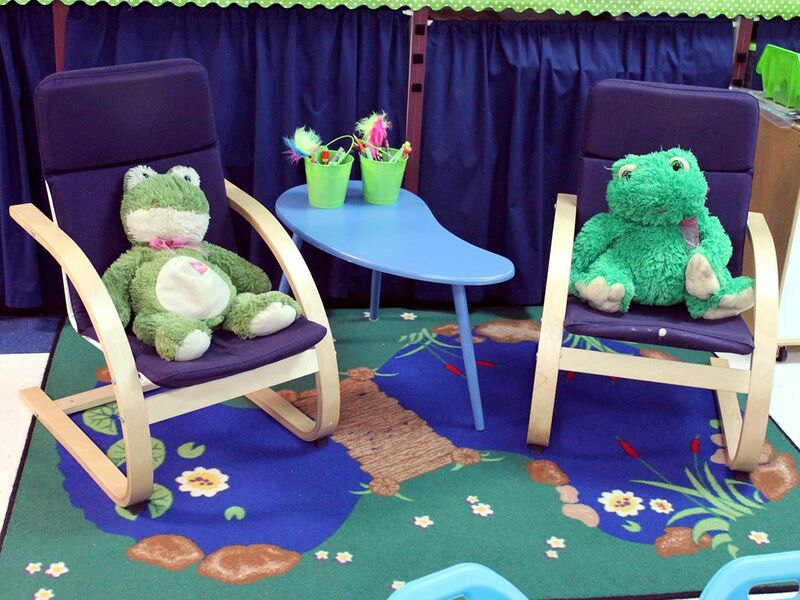 Tips: We spent the first month of school learning how to function in our flexible space. Students took “learning walks” through the room in order to identify “what learning might look like in a particular space.” Students worked together to come up with expectations for the different areas and for the different seating options in each area. Kenita Sutherland, Jackie Curts, and Anna Maziarka have church pews that accommodate several students each, and high tables that can be used while sitting or standing. 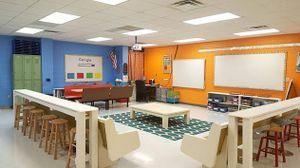 Sutherland, Curts, and Maziarka incorporated a range of tables and seating options to make their classroom comfortable. The huge space—originally three and a half separate classrooms—has a number of distinct zones for 60-plus students. 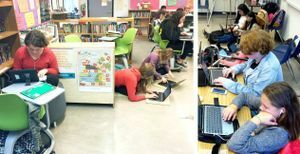 Mixed among their flexible seating options, Sutherland, Curts, and Maziarka still use traditional tables and chairs. Setting It Up: My flexible seating room was a DIY effort by my husband and me. My principal is very supportive, but there was no money in the budget. And we are a Title 1 school with high poverty levels, so asking parents for donations was out of the question. I wanted this for my students, so I began to scour yard sales and flea markets. I bought three tables and repainted them, and I removed sections of the legs from one of my traditional tables to make it suitable for kids. There are also beanbag chairs, stability balls, tall chairs, crate seats I fashioned, a bench with cushions, and various tables. Often students work on the carpet with clipboards. 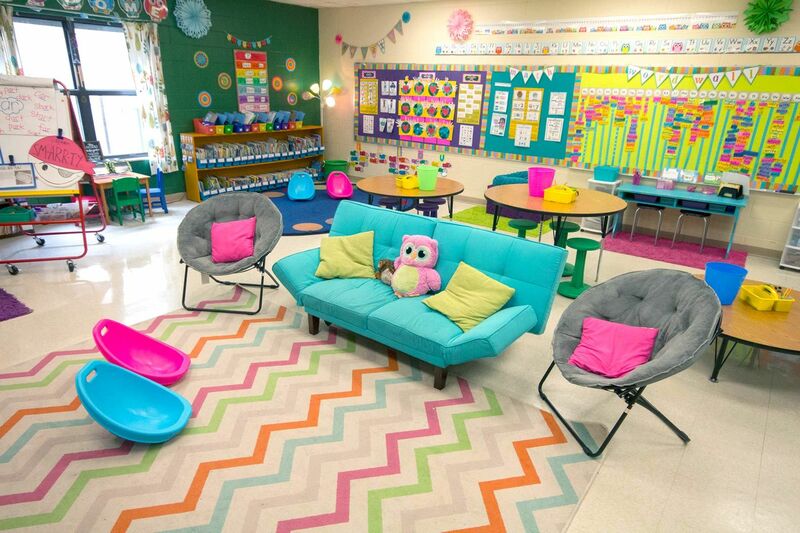 Tips: The first few weeks of school, my students rotated through all of the seating options. Sometimes students don’t work best in the places they think they will. I spent time teaching my students the proper way to use each seating option, and we made a list of expectations and strategies for success. My students know they’re in control, so they need to sit in a place where they can be successful. Also, I assign “home base” seats for my students; they sit there when there is a substitute teacher, or if they happen to be having a difficult day. Amy Mileham added a variety of seating options to her classroom, including yoga balls, lap desks, and crate and bucket seats. Working on a low budget, Mileham removed sections of the legs of one of her existing tables to create floor seating. As a Title 1 school teacher, Mileham went the DIY route. Using yard sale and flea market purchases, she repainted three tables, made crate seats, and added cozy touches like cushions on a bench. A flexible classroom can get messy, but teachers say the benefits outweigh that downside. Setting It Up: There are a variety of seats: yoga ball chairs, pillows, and bouncy bands on the bottom of chairs. I have two standing desks that were purchased, and I have a long table on bed risers to create more space for students who want to stand. 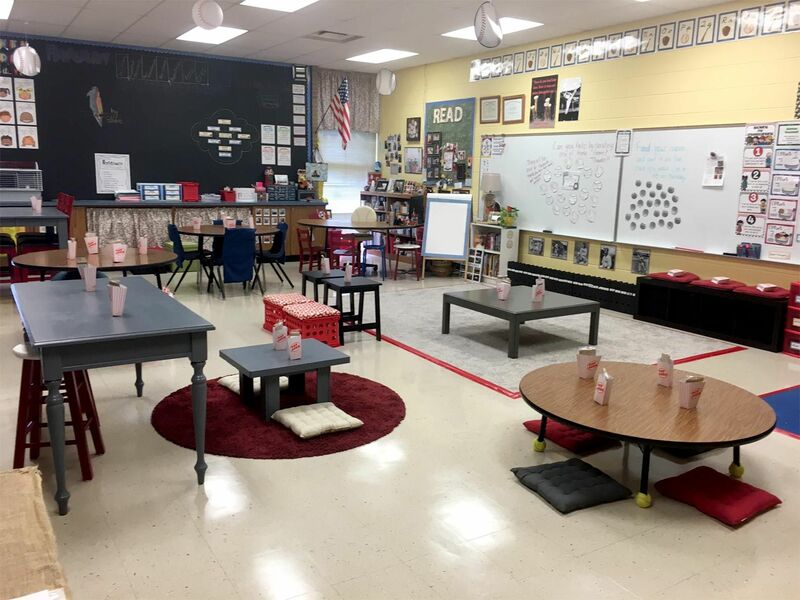 Last year was my second year doing flexible seating, and my biggest takeaway is that each group is different, and that’s OK. It’s a work in progress, and this year I added some stools to one of the standing tables. 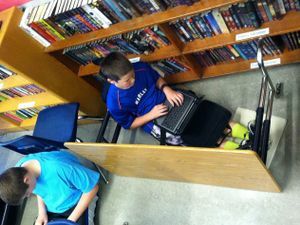 Tips: I keep some desks in my classroom for students who need their own defined space. I also assign spots at the beginning of the year, so all students have a chance to try out the different options. Each day the kids get a new seat, so they can try out the different options before deciding on which one they like the best. 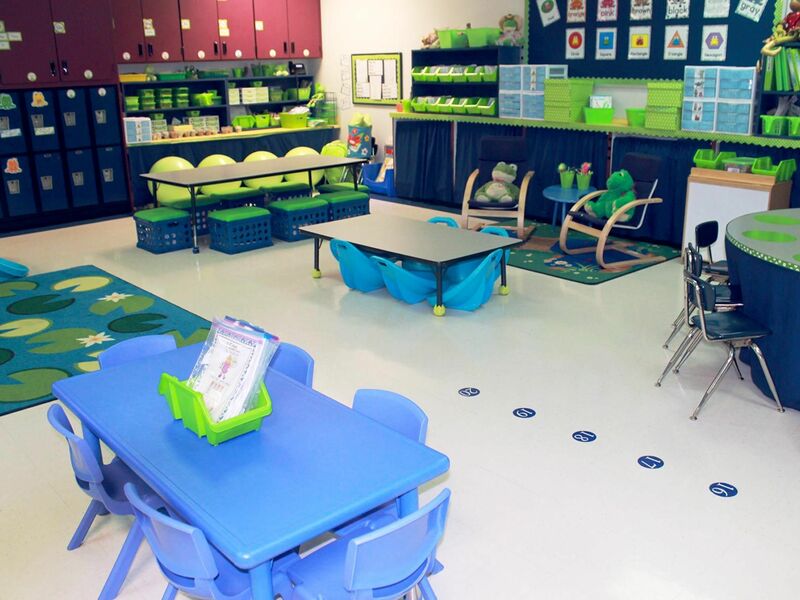 Like many flexible classrooms, Kate Roscioli’s has work areas at different heights to accommodate sitting or standing. Roscioli’s students can bring a lap desk with them, turning any area into a work space. Roscioli keeps some traditional desks for students who prefer them, but the bulk of the space is full of non-traditional choices. Setting It Up: I kind of half-stumbled into flexible seating—I still have 32 desks in my room! Students sit at assigned desks for attendance and direct instruction, but during long work periods they have some freedom to move around and get comfortable. I made simple adjustments to make it happen: I brought 35 carpet squares into my classroom and stacked them at the back of the room. Students figured out the rest, sitting in corners with their backs against the wall, lying under desks with rugs under them, working outside on squares on sunny days. Later, I transformed bookshelves into standing desks by making sure the tops were always clutter-free. I also let students flip desks and move furniture to create semi-private working spaces (students call them forts). 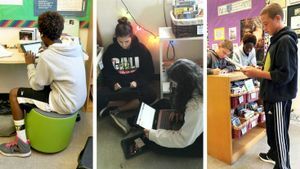 Tips: Making radical changes to the furniture didn’t turn out to be critical for me; I found that given choices, students can find ways to work that support their individual needs. 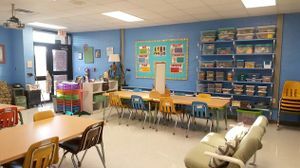 I start the school year by setting clear expectations with students: Can they really sit anywhere they want? Does that include under tables? 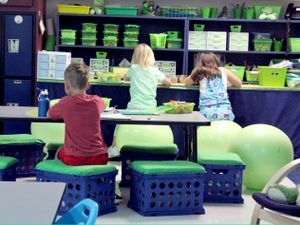 Do behavioral expectations change with seating options? 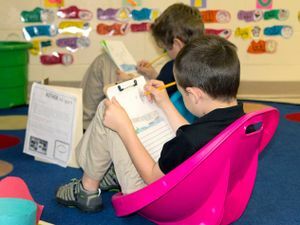 I also encourage teachers to have seating charts for the beginning of class: If you’re not there, the charts are a lifeline for your substitute, and they reduce the social anxiety of kids entering a room and not knowing where their friends are—or the location of the kid who keeps teasing them. Laura Bradley’s students work while sitting on stools and the floor—and while standing. Bradley’s approach emphasizes using existing furniture to create flexible spaces. 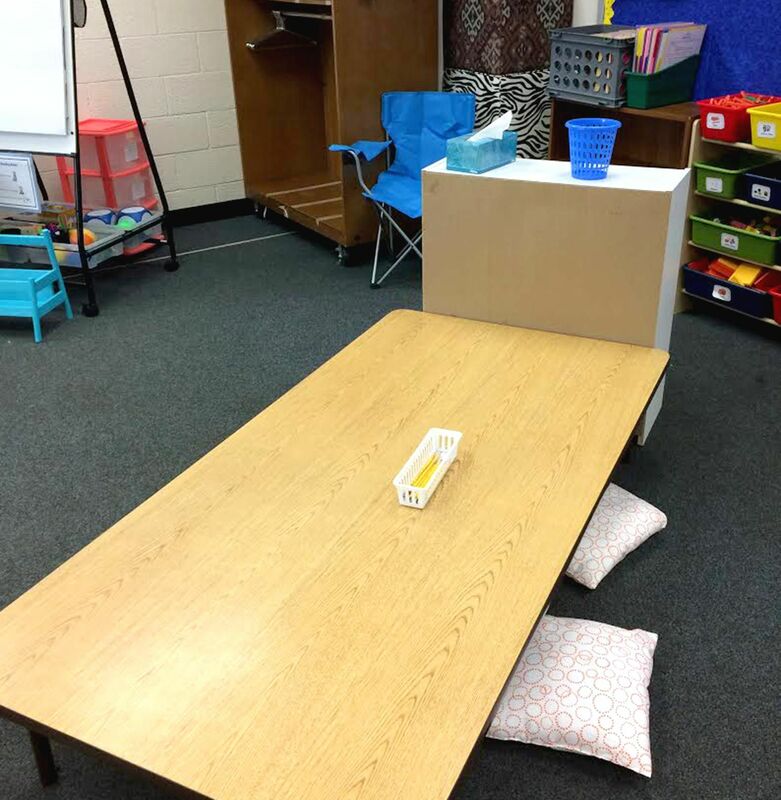 Here one of her students has created a private learning fort by flipping a desk. Bradley reports few problems arising from allowing students to choose their work areas. This article would not have been possible without the contributions and/or photography of the following educators: Sarah Boyles, Laura Bradley, Ashley Rice Broomfield, Jackie Curts, Tom Deris, Jessica Dudley, Kristina Herbster, Anna Maziarka, Amy Mileham, Benita Kay Moyers, Shawna Noller, Stephanie Novotny, Charity Peetz, Charlena Perrell, Amy Rever, Mary Rodger, Kate Roscioli, and Kenita Sutherland. Their classrooms are amazing, and we’re grateful they shared them with us.